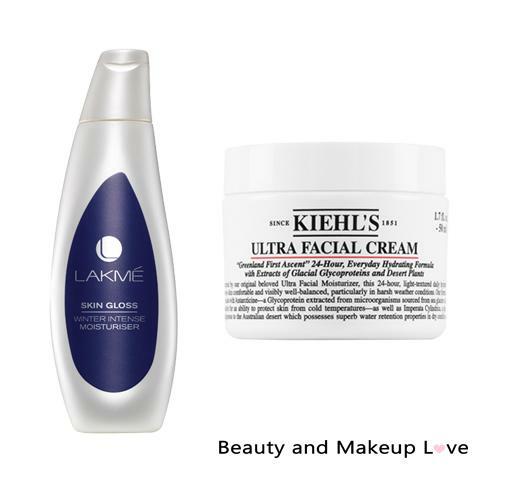 Best Moisturizer for Dry Skin in India: Our Top Picks! A moisturizer is something dry skin can’t survive without! Dry skin has the tendency to lose its natural oils, glow, elasticity if it is devoid of hydration. It leads to uneven skin tone, pigmentation and dry patches all over the face. Also the skin is extremely sensitive to sun rays and thus, it takes a heavy toll. It is very important to get a moisturizer which would help in locking down natural moisture into the skin and return the natural oils that have been stripped off the skin over time. Make sure you apply a generous layer of moisturizer everytime you wash your face to avoid fine lines from appearing. With winter around, dry skin needs a heavy-duty moisturizer that would nourish, replenish and rejuvenate the skin. At the same time it should not make the skin look oily and dark as well. 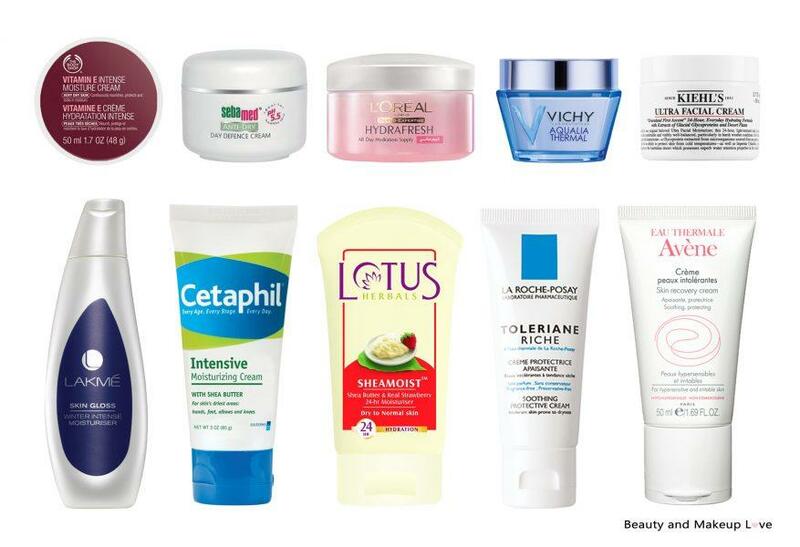 With plethora of options available in the market, it is tough to choose a moisturizer which would suit your skin. Thus, we have listed down the best moisturizers for dry skin in India that your skin would love and the good thing about them is that none of them would make your skin look dark or greasy which is a common issue faced with heavy-duty moisturizers and creams specially in winters. Let’s have a look at the list. If you are looking for an affordable moisturizer for dry skin, then your best bet could be Lakme Skin Gloss Winter Intense Moisturizer. The moisturizer is white in color and has a thick consistency but lightweight enough to spread easily on the skin. It gets absorbed quickly and instantly hydrates and replenishes the skin generously. The crème imparts a pleasant fragrance and soothes the skin upon application. You would notice a radiant touch and the crème doesn’t feel greasy or oily on the skin. The product can also be worn under make-up as a base which is a good thing about it! It is formulated with the goodness of Alpha Hydroxy Acids and Glycerin which would help in repairing the skin while moisturizing it adequately. This cream by Kiehl’s is Kim Kardashian’s favorite! The cream is white in color and has a light weight, non-runny creamy-gel like consistency. Due to this, it gets absorbed in a jiff and hydrates the skin, calms the irritation and makes the skin soft and supple. The Kiehl’s ultra facial cream works amazing to heal and repair sensitive, parched skin and is best suitable for dry skin. It has a slight medicinal smell but nothing overpowering. It is formulated with the goodness of glycerin, avocado oil, olive fruit oil, rice bran oil and soya bean oil. It is a little expensive but something worth splurging on if you’ve got dry, sensitive, irritated skin. The Cetaphil Intensive Moisturizing Cream is a multipurpose cream for face, body and other dry, irritated areas. It is white in color and the texture is a bit on the heavier and thicker side. It is a rich formulation which helps restore the protective barriers of the skin and the meadow foam oil in the cream locks in moisture for softer, smoother skin. The cream is non greasy and formulated with antioxidant ingredients to hydrate and soothe dry, cracked skin. The cream is also fragrance-free, dermatologically tested and non-irritating. Thus, it makes one of the best moisturizers for dry skin. The Lotus Herbals Sheamoist Shea Butter & Real Strawberry Moisturizer has a creamy and thick texture which is light pink in color. The consistency is good and spreads on the skin easily and also does not makes the skin greasy. It is best suitable for dry to normal skin. This moisturizer helps in restoring skin’s natural moisture and makes it supple and smooth with regular usage. The pleasant and delicate strawberry fragrance is surely a plus point. It is formulated with the goodness of shea butter and strawberry extract. The Body Shop Vitamin E Intense Moisture Cream is one of the best creams for dry skin and also a best-selling product of The Body Shop! It is light pink in color and has a thicker formulation. Despite that, it spreads well, gets easily absorbed into the skin without any greasy or sticky feeling. The cream will provide hydration for very dry skin and formulated with the enriched goodness of shea butter. There is also a special wheat-derived ingredient provides a protective layer on the surface of the skin to help lock in moisture. The vitamin E and wheat germ oil helps to protect against premature aging. Additionally, the product is Phthalates and cruelty free. 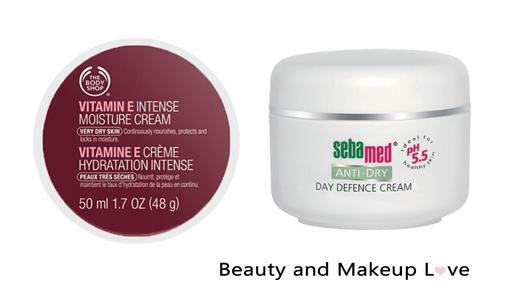 Sebamed Moisturizing Cream is white in color and has a thick creamy texture. It generously replenish moisture into the skin, making the skin soft, supple and hydrated. It adds a glow and supports and protects the natural barrier function of the skin’s acid mantle. It also protects the skin from pollution and is suitable for the most sensitive skin. The cream deeply hydrates the skin and gives you a healthy skin with regular usage. It is formulated with 26% lipid content which makes skin soft and smooth and 2% vitamin E which neutralizes free radicals (which are responsible for premature aging). It has no added colors and is dermatologically tested. 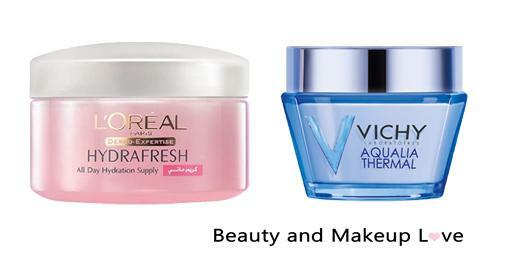 L’Oreal Paris Hydrafresh Aqua Cream for Normal to Dry Skin has a cream to water texture, and is light pink in color. It magically melts into the skin and delivers a vivifying fresh effect. It moisturizes the skin heavily and keeps the skin soft and smooth all day long with no greasy effect. The cream has a mild fruity fragrance which is pleasant and soothing! The cream is formulated with Hyaluronic acid capsules which is a powerful moisturizer that absorbs and seals in moisture into the skin. Further, the cream is rich in minerals and stimulates the skin’s self-moisturizing process. This product is a charm for dry skin. The Vichy Aqualia Thermal Light Cream has lotion like texture with a moderate consistency. It smells of regular cold creams and melts into the skin in no time. The optimal hydration allows the skin to undergo its natural repair process. It also helps to reinforce the skin’s natural moisture barrier, leaving a healthy, soft-feeling and more beautiful looking skin. It is enriched with the goodness of Vichy Thermal Spa Water and Hyaluronic Acid which is an added bonus and gives a plumped looking skin with intense moisture. The product is Hypoallergenic and is free of parabens. 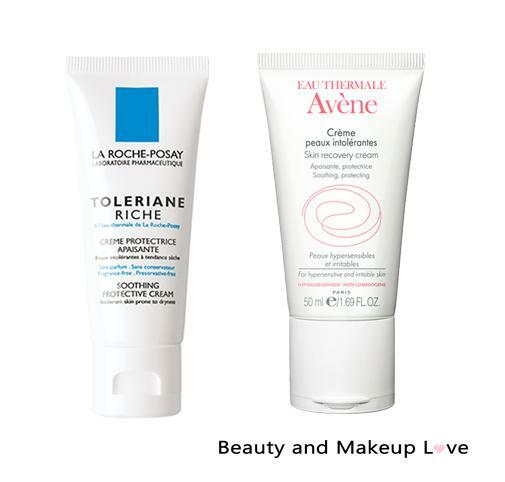 La Roche Posay Toleriane Riche Soothing Protective Cream – Price Rs. 2024 (approx.) for 40ml /1.35 fl. oz. The La Roche Posay Toleriane Riche Soothing Protective Cream has a balm-cream kind of texture and there is a slight hint of medicinal smell. It is best suitable for dry, sensitive and irritated skin. This cream is highly recommended by dermatologists for acne prone skin that has a tendency to peel and flake due to medication. It soothes and calms down irritated skin. The cream is formulated with the goodness of shea butter, replenishes skin surface with lipids to nourish intensively. Additionally, it is fragrance free and Preservative-free. The Avene Skin Recovery Cream is an ideal pick for dry, hypersensitive and irritable skin. The cream has a thicker consistency and a light weight texture which is what makes it an ideal moisturizer for dry skin. It spreads & absorbs easily on the skin without making the skin feel heavy or greasy. It hydrates and nourishes the skin really well. The cream is best suitable for extra dry skin and the blend of all natural ingredients makes it perfect for senstive and allergic skin. It helps to restore comfort to troublesome skin and rebuild the hydrolipidic film. Additionally, it is non-comedogenic, hypoallergenic, paraben-free, preservative-free, fragrance-free and coloring agent-free. An absolute must have cream for dry and sensitive skin in winters! Hope you’ve got some good options to pick yourself a best moisturizer for dry skin from this list! 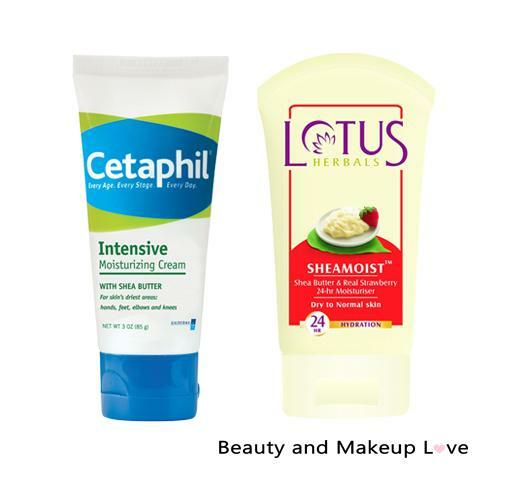 Currently I am using lotus ahead moist and I am glad it is in your list as well.great compilation. Previous Previous post: Best Scrubs for Oily Skin & Blackheads in India: Our Top Picks!